Airpura UV600 HEPA air purifier, Made In Canada is an extremely well-sealed portable high quality air purifier and it provides 3 excellent levels of air filtration protection for allergy, asthma and COPD control that includes the fast removal of airborne particles such as dust, pollen, dust mite allergen pet dander and pesticides. 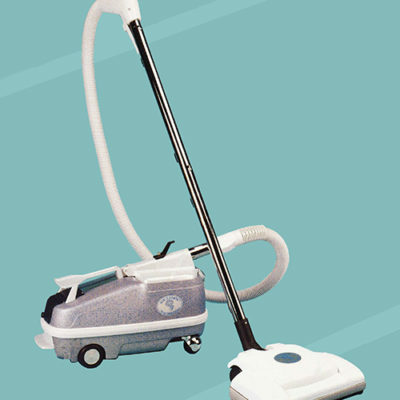 Out-gassing chemical removal from newer carpeting, home furnishings auto / truck exhaust and general air pollution plus the ultraviolet light removal and destruction of biological contaminants that include mold spores, bacteria and viruses. We recommend that the true effective cleaning range of the Airpura UV600 HEPA air purifier is just over 1000 square feet in an open area and for an larger sized master bedroom the Airpura UV600 HEPA air purifiers will produce up to 13 impressive air exchanges per hour. The 40 square feet true HEPA filter is 99.97 percent efficient down to 0.3 microns of particle size. Replace aprox once every 5 years. 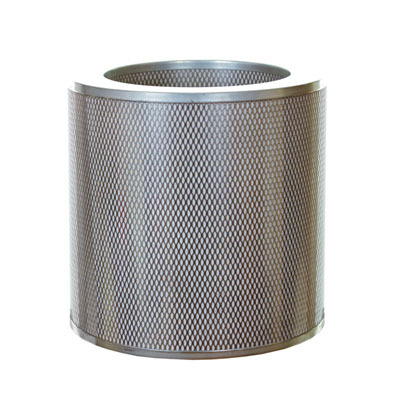 The HEPA filters are 100 percent sealed against air leakage with metal caps on both the top and bottom of the filter. The pre-filter in these HEPA air purifiers protects the HEPA filter by catching the larger dust particles and allergens before they can get to the HEPA filter. This allows the HEPA filter to last up to five years while catching the smaller more reactive dust particles and allergens down to 0.3 microns of size. 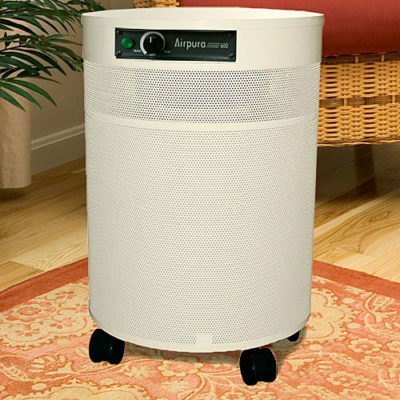 The pre-filter can be vacuumed off from the outside case of this Airpura UV600 HEPA air purifier for easy maintenance. The pre-filter should be replaced once a year with normal use. The hefty 18 pounds of activated coconut shell carbon does a wonderful job of removing by absorption of odors and out-gassing chemicals from your indoor air quality. NOTE: Anthracite carbon can be substituted for coconut shell at no extra charge for superior removal of car exhaust and wood stove smoke! Call Us Direct For Carbon Changes Before Placing Order! 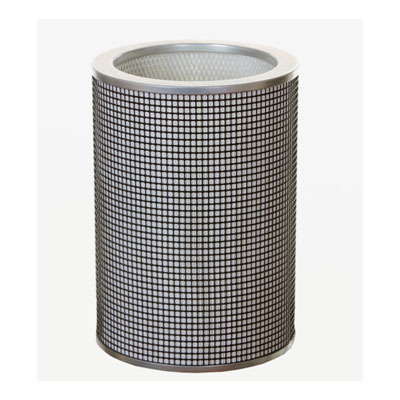 Carbon filter lasts up to 2 years depending on the chemical and odor environment. Replace when necessary. The powerful medical grade 100 percent (non ozone producing) 20 watt ultraviolet lamp is rated at 30,000 microwatt sec/cm2. This UV dosage is strong enough to destroy just about any type or biological antigen, pathogen, microorganism, mold spore or virus that can enter into this air purifier! The UV lamp is placed in the air purifiers filter chamber so the ultraviolet light can hit the intake side of the HEPA filter on all sides for the best kill ratio of biological organism contaminants in the air flow and on the surface of the HEPA filter. The UV lamp can be switched on and off when desired. Replace this bulb once every 10,000 hours or aprox once every 14 months of constant use. The quiet variable speed motor allows the user to adjust the motor speed, air flow rate and level of the desired filtration. The decibel sound level of this motor is 28.1 db on low speed and 62.3 db when turned all the way up to high speed. 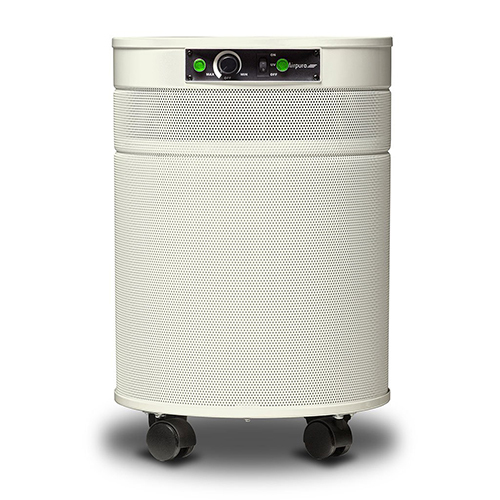 The air flow rate of this Airpura UV600 HEPA air purifier is up to 560 CFM with the filters and carbon not installed and between 420-440 CFM with filters and activated carbon installed as it normally would be when operating this unit. NOTE: This is still close to twice the CFM (Cubic Feet Per Minute) of most other higher quality air purifiers on the market! 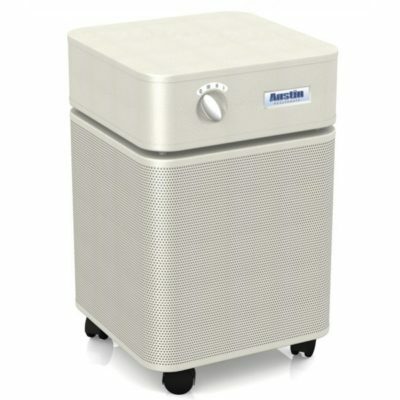 Please remember that these are HEPA room air purifiers! We recommend that for home use that one unit is placed into each bedroom(s) where someone is suffering from allergies, asthma, COPD or from a weak immune system. It is also a good idea to place another (Second) unit into the family room so when people travel through the home they are walking from one clean living space room to another. People with home offices and recreation rooms can also enjoy having allergen free clean indoor air by placing a unit into these areas as well. Please know that these air purifiers are made to run 24 hours a day everyday for many years to come! The electric cost averages only 35 dollars per year when operating these air purifiers non stop 24 hours a day. People going through chemotherapy, stem cell transplants, bone marrow transplants, organ transplants. Case Housing & Wheels: Non out-gassing powder coated steel mounted on four easy to roll caster wheels. Color Choices: White, black and cream, which is a light beige and the most popular color as it best matches most wood furniture. 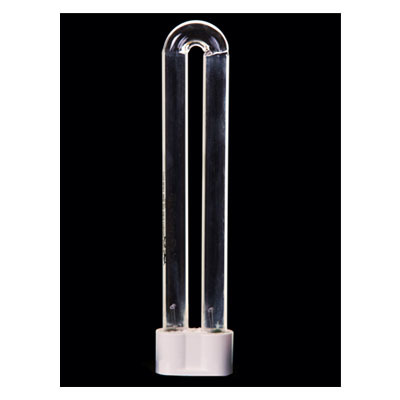 UV Germicidal Lamp: 20 watts rated at 30,000 microwatts sec/cm2.